A few days ago I made a short video on Periscope about Pinterest, tall pins and foodie illustrations. As these videos are only around for 24 hours I've decided to blog about the main points I mentioned, as many folks found it very useful. I'd like to point out one important aspect of Pinterest: approx 80% of pins on Pinterest are repins, so the image has kind of been 'recycled' over and over which is great as that's how your work is spread, and found in searches. So only 20% of pins are 'new' - they have been DIRECTLY uploaded onto Pinterest from a website or blog or shop. I do not have any marketing background - this blog post is just based from my own experience...and I'm not saying this is the correct way or the only way. First of all I'd like to point out that 8.5k followers is really not that many, there are other creatives with 50k+ followers. I feel my boards are representative of my major interests as a illustrator, and the sort of work I'm wanting to attract as well. I have my own illustrations on a board first then Love Food Illustrations, Pattern and Print, Creative Cards...etc based on how many pins I have on each board. This is my Love Food Illustrations board with its 2.2k followers -I really am a small fish. However I believe its one of the larger food illustrations boards on Pinterest. These are the 18 boards and pinners who have pinned the Infused Waters. Note Sara Piersanti's Drinks Illustration board....it has over 57k followers!! Now moving onto my Food Kitchen Pattern board which was created as I felt there was too much overlap with the Love Food board and I create many patterns with food myself. I'm not claiming that creating tall pins and having pins picked up by much bigger pinners is a guarantee of success. 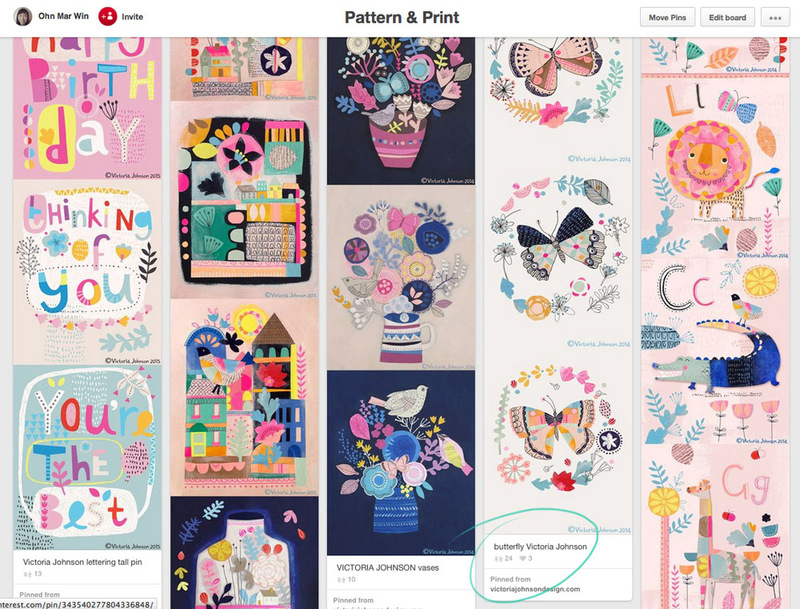 However because of the way Pinterest's algorithm is set up, art that has been pinned the most and most recently will come higher up in searches! That's something to bare in mind when seen from the viewpoint of a potential commissioning editor or art director. A little bit of effort on your part could pay dividends as getting seen by the right people is surely a wonderful thing. Please be assured it does happen. As I mentioned at the beginning of this post I am not a big player in the Pinterest stakes BUT as I have a food illustration niche, bigger players follow the Love Food Illustration board in particular. So if you feel inclined to create a tall pin on a foodie or pattern theme please send them my way and I will gladly pin!